The Agility May 2013 Release is a bit smaller than our usual release but still introduces two new features SSL Certificates in Dedicated Azure Environments and the ability to publish Linked Content items form the Ready to Publish report. It is now possible to use SSL certificates if you have a dedicated environment within Azure. Please contact support@agilitycms.com for more information. 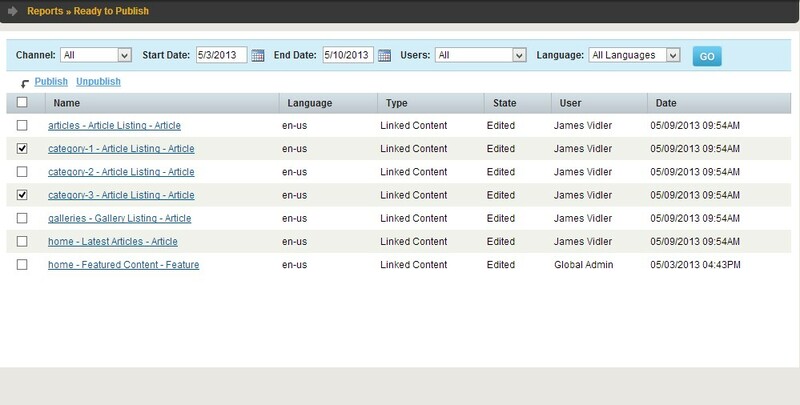 It is now possible to publish linked content within the "Ready To Publish" report. Previously, linked content on content items and modules were not available to be published through this report. Within Agility, you have the ability to Publish content across your site by using the "Ready To Publish" report found in the Reports section within the Content Manager. This report provides a list of all items which are in Staging across your site and allows you selectively decide which content you would like to Publish in one single action. Further, the "Ready To Publish" report also includes various filtering options such as by Channel, Date, Users and Languages. Navigate to Reports > Ready To Publish. Optionally filter your view of content items. Select each content item you would like to publish by checking the corresponding checkbox. When you are satisfied with your selection, click Publish.